, knt. lord chief baron of the exchequer, and an eminent law writer, was born Oct. 10, 1674. 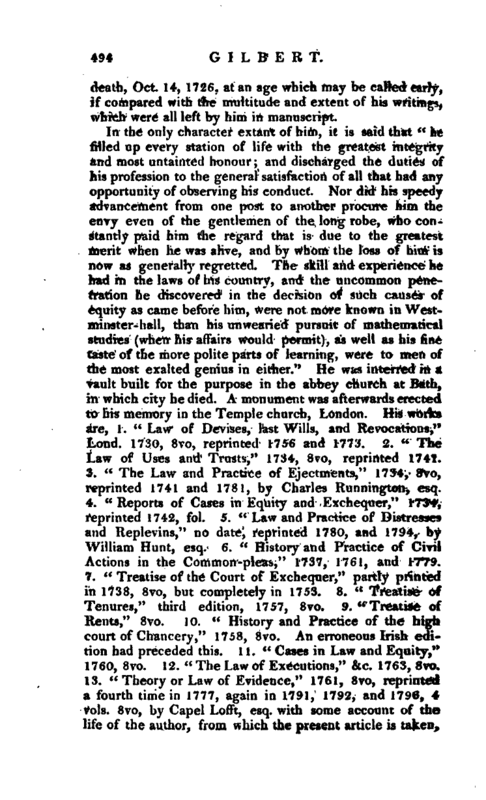 Of his family, education, or early life, it has been found impossible to recover any information* Either in 1714, or 1715, for even this circumstance is not clearly ascertained, he was appointed one of the judges of the court of king’s bench in Ireland, and within a year was promoted to the dignity of chief baron of the exchequer in that kingdom, which office he held till the beginning of 1722, when he was recalled. 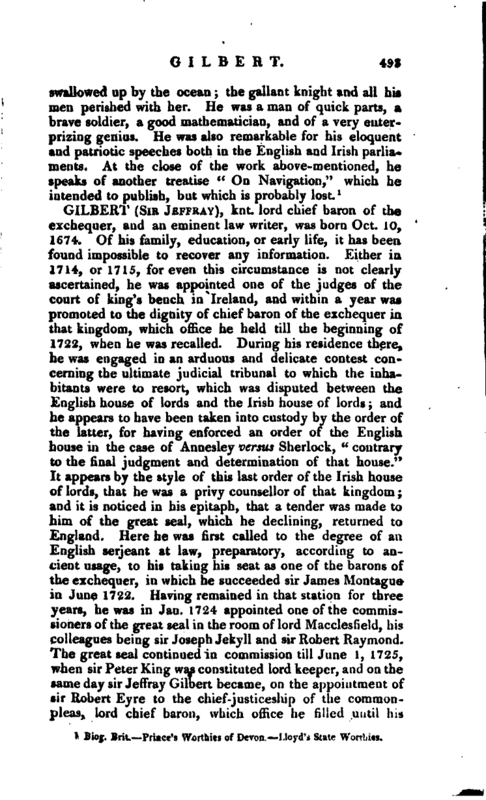 During his residence there, he was engaged in an arduous and delicate contest concerning the ultimate judicial tribunal to which the inhabitants were to resort, which was disputed between the English house of lords and the Irish house of lords; and he appears to have been taken into custody by the order of the latter, for having enforced an order of the English house in the case of Annesley versus Sherlock, “contrary to the final judgment and determination of that house.” It appears by the style of this last order of the Irish house of lords, that he was a privy counsellor of that kingdom; and it is noticed in his epitaph, that a tender was made to him of the great seal, which he declining, returned to England. 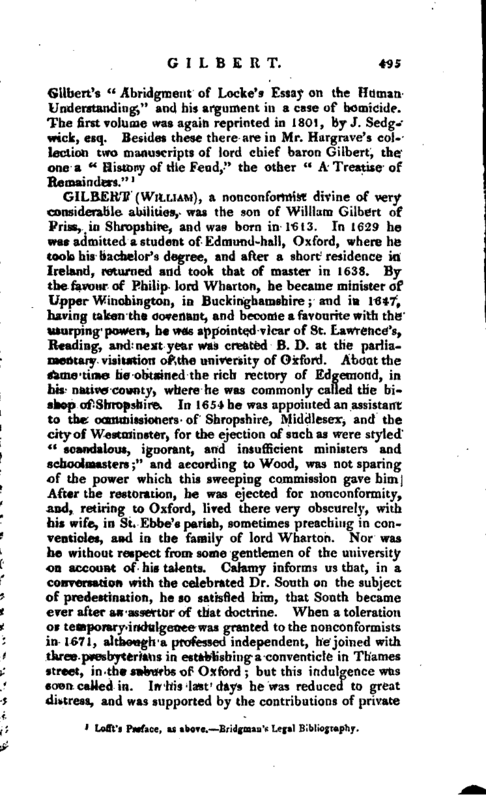 Here he was first called to the degree of an English serjeant at law, preparatory, according to ancient usage, to his taking his seat as one of the barons of the exchequer, in which he succeeded sir James Montague in June 1722. Having remained in that station for three years, he was in Jan. 1724 appointed one of the commissioners of the great seal in the room of lord Macclesfield, his colleagues being sir Joseph Jekyll and sir Robert Raymoqd. The great seal continued in commission till June 1, 1725, when sir Peter King was constituted lord keeper, and on the same day sir Jeffray Gilbert became, on the appointment of sir Rpbert Eyre to the chief-justiceship of the commonpleas, lord chief baron, which office he filled until his | death, Oct. 14, 1726, at an age which may be called early, if compared with the multitude and extent of his writings, which were all left by him in manuscript. Lofft’s Preface, as above.—Bridgman’s Legal Bibliography.